Fans of the Malazan world rejoice! We have many new pages to go through! 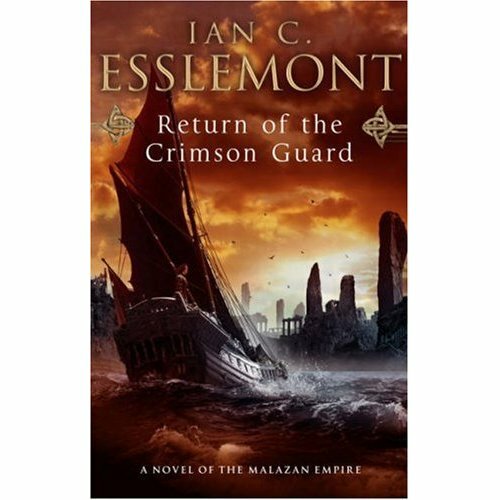 Here is my take on Return of the Crimson Guard by Ian C. Esslemont. While the forces of the Malazan empire are scattered around the world, Empress Laseen loses her control over it. Mallick Rel the priest and Korbolo Dom the first sword are scheming. A young rookie of the Crimson Guard is in search for the Duke while the Guard is preparing its grand return. Former fellows of the emperor Kellanved are helping a rebellion while soldiers loyal to the empire release a dangerous deity to protect a city. In the Otataral mines, a bunch of wizards are plotting a breakout. The second Malazan book of Ian Cameron Esslemont is a pleasure to read! In terms of characters, we are entitled to a mixture of old POV, new additions and mythical characters who finally have the spotlight. Speaking of those, being able to finally follow the feats of Skinner and Cowl (mentioned many times by Erickson) is very satisfying. As for the new additions, the adventures of Nait (Jumpy), a new Malazan sergeant, are very interesting. Action and humour aplenty. As for the story, the possibilities generated by the books of Erickson were taken advantage of. You learn a lot about the Crimson Guard and the main continent of the empire (the map is very useful). The pace is not very fast at the beginning and it takes some time to adjust to changes of POV and storylines, but we are moving slowly towards an epic battle which we will remember. Many many pages of fighting goodness. Writing? I was not sure what to expect since the first book was the narration of a single night (it was well written) with only 2 POV and I was getting accustomed to something big like Erickson. Well I think there is a great improvement. Esselmont has done a good job. Of course the comparison is inevitable with Erickson. It's not written as well but it does not affect the pleasure of reading the book. At least the chapters begin with quotes as in the first Erickson's and not poems (in my opinion boring in recent Erickson). Speaking of the relationship with Erickson, because they created this wonderful world together, the credit for building it also applies to Esslemont. And by the way, he's right on when he writes about Malazan marines. Return of the Crimson Guard made me want Stonewielder right now! You don't really have to read Night of knives before reading this book but you have to read Erickson books first. Technically, the cover for the Bantam Press print is gorgeous, the maps are complete and beautiful and the appendices are perfect.